Hi everyone! 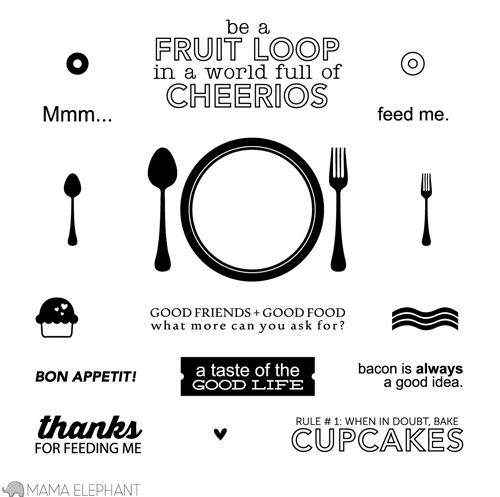 It's day three of the Mama Elephant August release highlights and today we are showcasing the set Foodie! (Which is available on the site NOW by the way) This set has a bunch of little elements that are great for invitations, parties, and favors! This was a perfect set to create my little table top scene! I stamped and embossed the place setting in gold and even made a little gold border "china" plate. 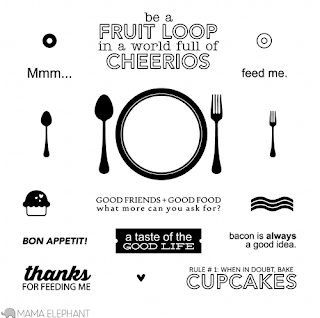 Of course, it wouldn't be complete without a placemat:) Easy and so cute for a hostess thank you card! Thanks for stopping by today! Hope everyone had a fantastic weekend! And I hope that you get a chance to drop by the rest of the DT to see what fun they had with this fun set! The gold embossing is fantastic!! Great idea! Nice set! Amazing card! Totally awesome table top scene...love the notched corners! I love how you set this up as a table setting...so clever, JJ! 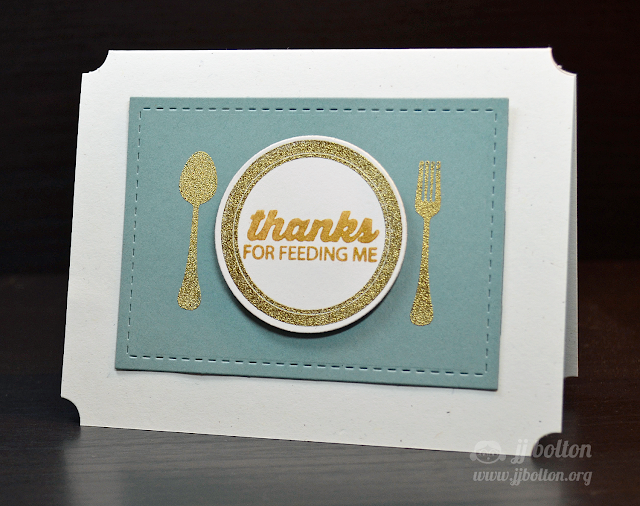 The gold embossing really makes it so 'Classy', too...Love this card!!! OH JJ!! I looooooooove that you created a table top scene! ADORABLE! LOVE the gold embossing-- YOU ROCK:) LOOOOOOOOOOVE x10000000! I love this, JJ! The gold looks amazing!